How might we make voting like a holiday? A celebration? Amp up the good: HMW harness the voters’ own energy and desire to participate in politics to fight suppression politics? Explore the opposite: HMW make voting the easiest part of political participation? Question an assumption: HMW entirely remove the in-person voting and obscure counting process? Go after adjectives: HMW make voting fun instead of arduous and obscure? ID unexpected resources: HMW make use of extant national information-keeping/data entry/data regulation systems to streamline this process? Create an analogy from need or context: HMW make voting like a holiday? A celebration? Play against the challenge: HMW make voting something that people want to do, and/or make counting everyone’s vote something that works in everyone’s interest? Change a status quo: HMW make voting less difficult and inaccessible for marginalized people? Break POV into pieces: HMW improve the conditions of people whose votes are suppressed and give them the material / social conditions to fight their oppression? HMW make voting more accessible? HMW make sure all votes are counted? I will choose the most straightforward HMW, “HMW make voting less difficult and inaccessible for marginalized people?” as my main guiding HMW question, but my 10 divergent ideas for addressing this statement spawn from the ideation process for all of these different HMW statements. 1) Encourage absentee ballot voting. 2) Create a user-friendly website breaking down legal terminology and centralize information about voting rights and proper procedures to remember in each locality (source this information from local activists and update regularly with new info; crowdsourced database but presented in a way that is accessible to everyone). 3) Campaign to make election day a holiday. 4) Leverage current information-keeping systems to capture more voters; e.g. register voters whenever they visit the DMV to get a drivers’ license or apply for a passport or go for a doctor’s appointment; have information about registration expiry timelines on display. This would both make sure more people have access to registration by integrating it with other parts of their lives and making it so that people do not have to go out of their way to access registration or voting, as well as help to effect a cultural shift towards voting being a normal and expected part of every citizen’s life. 5) Employ nonpartisan, legally-trained clowns as poll watchers. 6) Donate directly to grassroots organizations like Four Directions and have those resources be redistributed to Native tribes in order to pay people within tribes to get trained so that knowledge can be a lasting part of the community. 7) Legal change: Institute a government position that consists of independent voting trainers that can be overseen by the secretary of state who provide training to poll workers or poll judges — again, nonpartisan! 8) Implement tracking numbers for absentee ballots so people can see where they went and what happened to them, working in conjunction with the idea to encourage absentee voting to avoid a lot of the pitfalls that in-person voting practices are susceptible to. 9) Work with community organizations like churches and community centers to help them create and publicize transportation and resource distribution during election seasons. 10) Institute a mandatory maximum wait time for election day and a mandatory minimum polling center per population per unit area policy across the U.S. (inspired by the international IDEO design card). The topic I want to work on for the rest of the semester is voter disenfranchisement / voter suppression in the United States. While voting often seems like an ineffectual way of making change, I think it’s important to explore who is actively being blocked from voting. This is a topic that affects a lot of marginalized, underserved, and oppressed communities whose livelihoods can often be directly and negatively impacted by legislations or policies passed without them being able to exercise their voting rights on them. For example, disenfranchisement of incarcerated people in most states in the U.S. (all excluding Maine and Vermont) means that they would not be able to vote for candidates that are pushing justice system policies that directly impact their livelihood and well-being in positive or negative ways. In 35 states, people on parole are also excluded from voting, and in 31 of these states people on probation are excluded from voting as well (https://www.sentencingproject.org/publications/felony-disenfranchisement-laws-in-the-united-states/). Combined with the fact that mass incarceration overwhelmingly affects Black, Hispanic/Latinx, and Indigenous communities, we see a significant population in the U.S. being systematically deprived of their ability to exercise democratic rights. Some other communities that are affected by voter suppression include low-income communities who are not able to afford transportation to voting booths, indigenous communities (for example in North Dakota with the recent Supreme Court decision to only allow people with residential addresses register to vote: https://rewire.news/ablc/2018/10/11/supreme-court-native-americans-november/), and numerous other people and communities who identities often overlap and intersect with each other to become targets of voter suppression. There are a number of things that have been done in this area already by groups like the League of United Latin American Citizens, who worked on training poll watchers to not partake in voter intimidation, or Patriot Majority USA who ran voter registration drives in 2016 (“In 2016, Patriot Majority USA funded a successful voter registration drive in Indiana, empowering tens-of-thousands of African-American voters despite state-sanctioned harassment by officials appointed or closely aligned with then-Governor Mike Pence”). Heading into this midterm election, I’ve seen a lot of social media entities like Instagram and Facebook putting in notifications to users to remind them to vote. And a lot of community organizations, from non-profits to student orgs, are canvassing and asking people to register to vote ahead of the election. 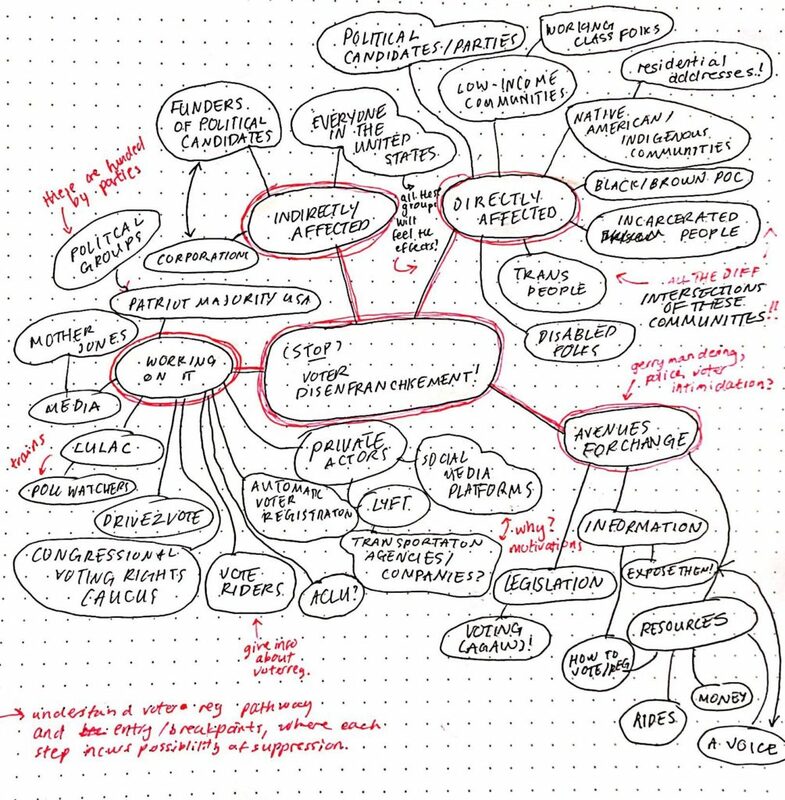 For this project I would like to investigate further the means through which voter suppression and disenfranchisement happens in the U.S. and design a convening to think about ways to combat it, especially when disenfranchisement strategies are implemented in systematic and seemingly unbeatable ways (e.g. restrictions on voter ID qualifications). These gatherings will center on where we can go and what we can do in the world as students at elite universities, which is a position that we strive to recognize and deal with as it relates to a number of other positions of power that each of us occupy along various axes of privilege. We consider all of these positions and what kind of consequences and meanings they have for us and for our communities, using those reflections to guide and ground our work. We look towards the guidance of our communities both within and especially outside of the university to design actions and solutions that actually work to serve people in a grounded, informed, and effective way. We recognize that student activism must be connected with and on equal footing with the communities that we occupy and often gentrify. We are inclusive, intersectional, and non-hierarchical. We want to equip students with ideas and tools to go forward into the world and work towards making the positive impact that they want to. Because of this, we want to know: what can we do concretely for our communities, for the world? We work towards developing action rather than despair. We are realistic and authentic. While we remain committed to a better vision of the world, are realistic about what methods we have for change and our capacity to execute them. We are humble and curious and always thinking about what we can do to live in a way that aligns with our values and politics as a group. In the wake of recent political events, but also in general, I’ve been feeling very helpless about what methods I have and what effects I can have on making the world a more equitable place for everyone. I often see popular memes in elite university meme groups about people having anti-capitalist or otherwise broadly social justice-oriented politics, but ending up going into consulting or finance despite that. Responses to these memes include pointing out the potential hypocrisy of criticizing students who choose to go into the private sector by people who want to remain in academia (corporate-funded!) or even go into the non-profit sector (beg for corporations’ spending money!). In general, I feel like a lot of people share my sense of being lost about what paths we have going forward from university, especially elite universities like Harvard or MIT where the allure of high-paying finance or tech jobs is almost inescapable. This event that I want to plan would be like a hackathon, except not called a hackathon so that I can disassociate it from hackathon stereotypes like staying up late and devising solutions to huge societal problems in 24-48 hours. It is held in the new student center on campus and we would make a specific effort to get non-Harvard undergraduates to participate, from a wide variety of backgrounds; organizers would reach out to community leaders and members around the Cambridge and Boston area to attend. The goal of this gathering would be to create an action plan for students who want to get involved in direct community service and be effective to the people and causes they want to serve today. Further iterations of the event could include critical examinations of pathways out of elite institutions led by a panel of people who went down those paths to think about what kind of life trajectories are possible from our starting points. Because I was not able to participate in the group design exercise in class, I am instead submitting a reflection based on Winner’s “Do Artifacts Have Politics?” that seems to be one of the crucial texts upon which we’re basing our analysis this week. I thought this reading was particularly interesting because it connected to the previous week’s discussion about the four levers of social change. The politics of an artifact can also be read as the code that is baked into the components of the world we’re surrounded by, and it’s interesting that code was one of the hardest levers to ideate on during our billionaire pitch challenge because it was hard to think of ways we could strategize change in the subtle and almost deterministic ways that Winner describes in the paper. While these kinds of innovative space designs are trendy, creative, and eye-catching, the priorities of who the space is designed for becomes clear through the utilities that the objects can serve. Something I’m thinking about now as I also have experience working at an architecture firm is the big trend towards glass and clean, simple lines. While I’m also a fan of the look, I wonder what that translates to in terms of comfort and surveillance, and what audience is able to enjoy these kinds of design trends. Anyways, next time you sit on a bench, maybe you too can now ponder who the bench designer is trying to discourage from sitting on it. One issue I’m really interested in working on is reparations for slavery and colonization, particularly in the United States. This is a pretty big idea but I think reparations are an essential part of working towards reconciling a lot of unjust foundations that this world is built upon. Law: Echoing the calls for reparations that Ta-Nehisi Coates made in his well-known article (The Case for Reparations), reparations policies could go through law and be made into policies that provide direct reparative resources, such as land, symbolic reparation, and financial stipends. For example, the conversation on land restitution in South Africa is an example of how the U.S. government could think about going about providing reparations for slavery and even Jim Crow-era policy. Norm: Public information campaigns to normalize reparations and wealth redistribution on an everyday basis and make known the idea that reparations should be instituted in some form for slavery and colonization of indigenous land in the U.S.
Market: Institute some “micro-finance” type of program (but not loan-based, just giving money) which might incentivize well-resourced people and corporations to help provide the conditions for marginalized people to succeed and gain capital. Code: Automate the transfer of some small portion of funds of payment systems to go towards reparations funds. For example, some portion of tuition payments could be pooled to pay for tuition for descendants of enslaved people as was demanded of Georgetown University due to its history of being built upon the foundation of the slave trade. I have background in social sciences, particularly ethnic studies, so another project I am interested in is “open data”-related work (e.g. Berkeley Initiative for Transparency in the Social Sciences) especially in connection with police departments around the country. Law: Update data transparency laws, with collaboration from current developers and data scientists so there are clear standards. In a similar vein to financial accountability laws, police departments should be required by law to make statistics on race, income, gender, sexuality, incarceration rate vs. offense, salaries, financial statements, etc. public. Market: The norm lever could be combined with the market one to have consumers and public funders to go against institutions with low data transparency, which is against the market interest of the actor. Code: I think a lot of this problem has to do with the amount of resources people are even willing to put into data transparency, so the availability of code seems to not be the issue here (since the potential to collect detailed data or publish it already exists). One idea I had is that you could automatically log police officer actions somehow and push them to a publicly accessible database for accountability. We talked about this a little in class when discussing mass incarceration, but the current cash bail system and the bail bond industry that’s been built upon it has huge potential for and realities of abuse which overwhelmingly targets poor people in a massively unfair way, and has been shown to be linked to higher actual incarceration rates when people actually do go to trial. Pre-trial detention based on how much you are able to pay is unjust, but current methods of dealing with it by using things like algorithms are also filled with potential to be wrong and prejudiced. Norms: Talk about cash bail and how it’s unfair. Especially bail bonds — it seems to be pretty normalized in the U.S. which was weird coming from Canada, but when I talked to people I know here they seemed to just accept bail bonds as something that happens in life. Not great! Market: Disincentivize bail bond companies and insurance companies that back them in some way. Implement huge taxes on bail bond income or something (although this is combined with law in a big way). Code: Reduce the use of cash bail by overhauling the pre-trial detention system in the first place. I’m writing about a project i did in high school, as gaining some time and distance from it has produced some reflections I think can be framed in terms of the questions asked in class. I spent the last two years of my high school career working on a program at my public school to help students find networks of other students and improve their studying skills and ultimately their school performance. This was meant to break down barriers to entry, whether financial or emotional, to more institutionalized programs like tutoring or even informally asking for help from teachers or other students. I researched and produced a proposal for an open peer learning space held in a couple of classrooms after school each week where high-performing and experienced students would volunteer to staff group study sessions and be there to answer any questions that people might have. We even produced study guides on popular subjects with notes and practice questions that we placed around the rooms for students to take home. My idea was guided by proponents of social learning and a desire to produce materials to help our huge and understaffed school population gain the resources to succeed as much as possible given our circumstances. This was the scope of my problem: within the bounds of my school, connect students with each other and enable them to get the help they need. Who is best positioned to address the problem? Upon first reflection, the answer to this question is students at my high school, which included me! However, part of the problem was that there was a pretty clear divide on the amount of resources my school invested in the honours versus the regular program, and I wanted to break down barriers between students in those programs so they could help each other. So, to be more specific, a non-honours student who is struggling in school would be best positioned to address the problem. This is the demographic who would be affected by the program in the first place. What are predictable consequences of the proposed solution? The most predictable consequence was simply that this project would fail to be adopted on a large scale by students and/or cease to exist after I graduated. I had read extensively about this kind of study program being used at other schools and universities, which improved my hopes about participation. But as with most clubs and events hosted on high school or even college campuses, participation rates are often a basic thing and a real worry. While the study program really did help some people I was trying to help and was adopted by a number of students (and a lot of volunteers from the honours program), the rooms weren’t always full and I’m not sure if it continues to exist today. While the program was on the whole successful and its disappearance wouldn’t cause much direct harm, I continue to think about my own motivations in creating it, since in truth the development of the program was geared towards college admissions. I wonder about the ways I could have approached the program’s development if I had not been so bent on making this program succeed since I had dedicated so much time to it — perhaps I would have been willing to make major shifts in the structure based on student feedback, or share the direction and leadership of the project with the people I was actually trying to help. And I think this kind of problem continues to happen with justice-oriented work past high school, no matter how wholesome the original intent. What kinds of reflection are we missing when we’re trying really hard to get some grant, or some type of recognition for our work, or even just personal fulfillment?